Firstly, huge apologies - I have been downright neglectful when it has come to my blog lately. I've had a few busy weeks and have been a little bit stressed out with changing my job and haven't had a lot of free time, but things should resume to normal soon! 3. Vintage Lissy - such a fantastic Birthday present, my Uncle managed to get an old long lost VHS video of my sister burnt onto a DVD. I watched this in bed in the morning whilst eating my Birthday breakfast. Various little clips of me aged 1, 2 and a very bossy 3 (my poor little sister!) - very nostalgic and a great gift! 4. Birthday Cards - I'm one of those people who loves cards on their Birthday, of course I love presents too, who doesn't? But I love cards and the thought that goes into them. Probably why I love sending cards too and spend hours traipsing around several card shops every time it's someone's birthday to find the right one! 5. Retro Cake! - My Mum never fails to make me smile - and this cake was no exception! at lunchtime on my Birthday we went over to my parents for a special Birthday lunch. Bucks fizz and lots of yummy food followed by this lovely cake. So great to see my parents on my Birthday. 6. 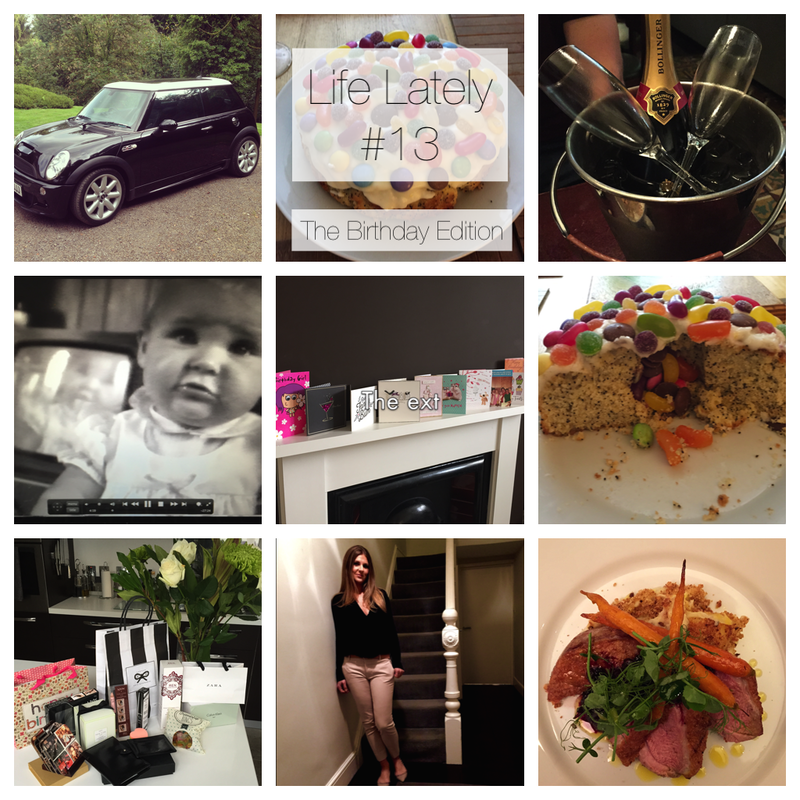 Spoilt - I honestly was not expecting such a lovely array of gifts on my Birthday. Anya Hindmarch and Zara featured heavily as well as some lovely personalised coasters from my best friend Sian and some fantastic NYX beauty bits that I'll be blogging about soon! 7. Birthday OOTD - I wanted something relaxed and comfortable for going out for some dinner (and since we were walking to the restaurant flats were essential!) I opted for Zara black blouse / Zara beige trousers / Valentino Rockstud flats and Charlotte Tilbury Dolce Vita Palette on the eyes! 8. Arbennig Restaurant - this is one of our favourite little restaurants in Pontcanna. The food is always fantastic and really reasonably priced. I had smoked beef salad to start followed by duck breast with a blackberry sauce and leek & potato crumble (photographed) highly recommend to those of you visiting Cardiff! Promise to be back with you soon! I love your Mini!!! Coolest gift ever for sure! Happy birthday Elisabeth, looks as though you've has a wonderful week celebrating!